You must look out for number one. You never thought you’d hear that from a pastor, did you? But that is because the church in general has condemned and criticized this attitude as self-centered and unchristian. Looking out for number one is the main object and goal of most of the world. Christianity in general has condemned and criticized this “me-first” mentality. We are reminded that the Bible is about giving ourselves away, and looking out for the needs of others rather than our own. And all of that is true. I will not deny it for a second. But one overlooked emphasis in the Bible is that while we are putting others above ourselves, and being self-sacrificing rather than self-serving, there is still one area of our lives where we must first and foremost look out for number one. The Bible teaches that in one area of our lives, to be all that God wants us to be, we must first and foremost look out for number one. It is the area of personal holiness. Christians today are weak on holiness. We would rather point out a dozen sins in the life of someone else than take an honest look at the sin in our own life. We love to point the finger at others, but when someone points it at us, or when the Holy Spirit convicts us of sin, we are quick to defend our actions and make excuses for our failures. When it comes to sin, and developing a life of holiness, you must adopt a “Me-first” mentality. Take an honest look at your own life, before you try to point out sin in someone else. An honest Christian reserves his strictest criticism for himself. Paul writes in 1 Timothy 4:16 to watch your own life and doctrine closely, for in so doing you will save both yourself and your hearers. Look out for number one. Not for selfish reasons, but for sanctification reasons. Don’t think that you can go about and correct everybody else, when you have some glaring faults in your own life that must be dealt with. And if you think you don’t have any glaring faults, you better look again. All of this is what Christ teaches in Luke 6:39-42. These verses begin the section in Christ’s Discipleship manual about our attitude toward ourselves. Luke 6:27-38 was about our attitude toward others, and we saw last week that we when we judge others, it must be a correct judgment. It must be a judgment of mercy and forgiveness. Luke 6:39-42 continues this idea of judgment, but shift from talking about correctly judging others to judging ourselves first. When you judge, judge yourself first. To show this, Christ uses three pictures. The first picture is of blind guides. Luke 6:39. And He spoke a parable to them: “Can the blind lead the blind? Will they not both fall into the ditch? This is an example of the humor of Jesus. He loved to tell jokes, stories, and paint word pictures that were humorous and memorable. Have you ever seen a blind man leading another blind man? Of course not! The idea is just comical. Imagine where they would go. Imagine what trouble they would get into. Imagine how much they would get hurt. I was watching a movie once where a blind man was standing at the crosswalk of a busy intersection. Another blind man walked up beside the first and said, “Help across the street?” The first blind man, thinking that the second was offering help, not asking for it, said, “Sure.” And together, arm in arm, they stepped off the curb and into traffic. You know what happened. Cars went screeching to a stop. Onlookers screamed out warnings. Both blind men almost got ran over. This is the way it is when you are spiritually blind and trying to lead someone else. There are some who believe that this verse means we should make sure we are not following blind guides, and while that is true, I think that it first and foremost applies to us, that you and I should make sure that we are not blind guides. So are you a blind guide? Are you blind? I don’t mean physically blind, but spiritually. Are you spiritually blind? If you have never placed your faith in Jesus Christ for eternal life, then you are spiritually blind. In 2 Corinthians 4:4 we read that the god of this world, Satan, has blinded the minds of unbelievers so that they might not see the light of the Gospel and believe. Satan will allow unbelievers to do all sorts of spiritual things, as long as they do not understand and believe the Gospel. He doesn’t care if people love God, and go to church, and read their Bibles, and get baptized and give to the poor, and pray, and many other spiritual activities, as long as they do not understand and believe the Gospel. The whole world thinks that they are getting to heaven based on their good works. But those of us who have been healed of our spiritual blindness, realize that we get to heaven based on Christ’s works, by believing in Him for eternal life. In this way, we receive our sight back. But once we have received our sight back, we still have blind spots. These are areas of our life that we conveniently ignore. If you have believed in Jesus for eternal life, you are not blind. But even if you are not blind, you may still have blind spots. What are your blind spots? A blind spot in real life is one of those areas of our vision where we think we can see, but we really cannot. Take a piece of paper sometime, and put two dots on it, about two inches apart. Then hold the piece of paper about six inches in front of your face and close one eye. If you close your right eye, then look at the right dot. If you close your left eye, then look at the left dot. When you are focused on the dot, slowly move the piece of paper closer or further from your face. At first, you will be able to see both dots. But as you move the paper, the dot you are not looking at will disappear. You’ve discovered a blind spot. Everybody who had taken driver’s education also knows that blind spots lead to a lot of car accidents, which is why whenever you are changing lanes, you need to do a shoulder check. We all have blind spots, and we need to become aware of them, and compensate for them in order to protect ourselves and those in the car with us. Spiritually, it is exactly the same. Though we have been given our vision again, we have been healed of spiritual blindness, we still have blind spots. And if we do not have them pointed out to us, they can cause great damage in our lives, or to those riding in the car with us. A lot of people think that once they become a Christian, everything is fine and dandy, and there is nothing to watch out for. Quite to the contrary, it is only after you become a Christian that the potholes, obstacles and dangerous curves in the road really multiply. It is very possible for Christians to become deceived and fall into sin and error. These areas become blind spots (2 Pet 1:9; 1 John 2:11; Rev 3:17). When this happens, Christians don’t lose their salvation, but they do lose some of their spiritual sight. They lose their ability to discern good from evil, truth from error. And if they allow this condition to continue, it may turn into tunnel vision and cataracts so that such a Christian has very little vision at all. This is why it is so important to go in for regular eye exams. Every day, Christians should be going to God, their spiritual eye doctor, and asking Him to check their vision. As you get into the Word, as you pray, He corrects your sight and He shows you what to watch out for. It is vitally important to have this regular eye exam, because it is not just you in the car. There are people who trust you to lead them to safety. It may be your children, or your spouse. It may be a friend. It may be people in the church or community who are following where you lead. 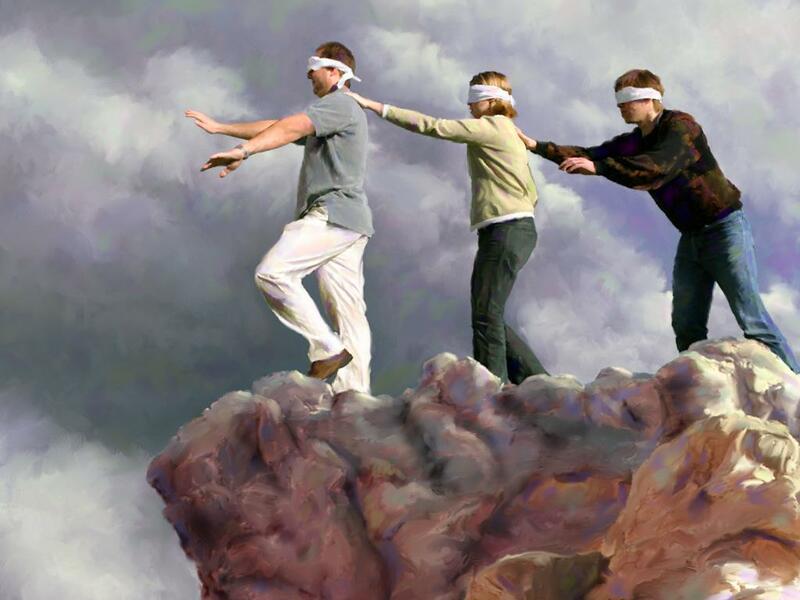 If you lead them off a cliff because of poor vision, God will hold you accountable. When you do this, you are going to the only person in the universe who has no blind spots. As long as we are following other people, even if they are called “Pastor” or “Reverend” or “Dr.” it is certain that they have blind spots and we will be the blind following the blind. But if we go to God, we know that He alone has no blind spots, and we can follow His faithful and true guidance. Look to yourself first by following Jesus through the indwelling Holy Spirit. Let Him alone be your guide. Before you point out the weaknesses and failures and blind spots of other people, make sure you have gone to the “I” Doctor and allowed Him to correct you first. Jesus brings about this same exact point in Luke 6:40 with another picture, this one of a student teacher. Luke 6:40. A disciple is not above his teacher, but everyone who is perfectly trained will be like his teacher. This is another humorous picture. Imagine for a moment, those of you who have children in grade school, if your child came home from school tomorrow, and told you that at school from now on, the children were the teachers, and the teachers were going to learn from the children. The children were going to choose the curriculum, and they were the ones who were going to stand up in front and write on the blackboard, and make the tests. The teachers were going to sit in the desks and take notes and read the assignments. You, as a parent, would get mighty upset. You are sending your children to school for them to learn from the teacher, not to teach the teacher. The teacher has more knowledge and training and experience that you want passed on to your children. It is ludicrous to think that the students will teach the teacher. It’s humorous to think about, but did you know that in certain schools around the United States, this very thing has been happening? One high school teacher stated that what her students say in class is just as important as what she says. So if they wanted to get up and teach, she would let them. In another case, a state university literature professor told his class that since words do not help communicate, they were, therefore, pursuing nonsense. They would learn just as much by saying nothing in class, or by someone standing up and spouting gibberish. I am not making these stories up. This sounds as silly and pointless today as it did back in Jesus’ day. Students do not teach their teachers; they learn from their teachers. It is ludicrous to think that you send your children to school in order to teach the teachers. Teachers teach; students learn. Jesus’ point here is twofold. First, you must understand that you are a student. You are a learner. You are a pupil. Far too many Christians think they’ve got it all figured out, and they don’t need anybody to teach them, or correct them, or speak into their life. As soon as you develop that sort of an attitude, you become a student trying to teach your teacher. The person you should be learning from, you are ignoring. So you must have an honest realization of who you are. You are students. This whole section in Luke 6 is the Discipleship manual, and disciple is just another word for student. Now understand, as a student, you may have opportunity to teach others, but the best teachers are those who are students first and foremost. Someone once said that it is always better to drink from a running brook than a stagnant pool. If you are soaking up information from your teacher, you will be a better teacher to others because fresh, clear water is flowing through you. This brings up the second truth of Luke 6:40. The first was that you are a student. The second is that you must know who your teachers are. This point is also made in Luke 6:39, but it is clearly brought out here. All of us are following someone. All of us are listening to someone. All of us are taught by someone. Do you know who that someone is? It is very important that you pick only the best and wisest teachers to speak into your life. Who is speaking into your life? Far too many Christians spend way too much time sitting at the feet of a very popular teacher called television. I watch television, and there are a few shows Wendy and I love to watch. But I used to watch a lot more than I do now. And do you know what I have realized? Now that I do not watch nearly as much, my thinking is clearer, my relationship with God is more intimate, my prayer life more meaningful, my sleep is better, my temptations are fewer, I now have more time with Wendy and my girls, I have more hours in my day. Television is a teacher we can all afford to get less of. But aside from TV, there are many other teachers we must avoid. The ones that are the most damaging are the ones who seem so right. I watched a pastor preach on TBN a few months ago, and I heard more heresy, worldly philosophy, human wisdom and outright error in that half hour show than I would have received watching almost any other show on TV. I had never heard of him before, and even now, I can’t remember his name. But I do remember his face. When I was in Illinois, I was browsing through a bookstore, and found that he has just come out with a new book. I knew it was his, because his face filled almost the whole front cover. Considering the possibility that the one sermon I heard was not a good representation of his beliefs and teachings, I leafed through his book. I found it chock-full of more error and false teaching. Yet he has thousands of followers who attend his church, watch his show, and read his books. They all think it’s fine, because he’s a pastor, and he’s on TV, and he sounds pretty good, and he quotes Scripture. But he is not fine. He is a wolf in sheep’s clothing. And according to Luke 6:40, those who listen to his teaching will become just like him. Deceived and blind. It reminds me of Matthew 23:15 where Jesus condemns and disparages the Pharisees for traveling hundreds of miles to make someone their disciple, but when they are done, their disciple is more of a son of hell than they are. You must be so careful about who you allow to speak into your life. So who should you allow to speak into your life? I’ll tell you who…me. A Godly teacher on the other hand, will point you to God and the Scriptures, not to himself. He will welcome challenges and questions. One of the greatest compliments you can pay a Godly teacher is to search the Scriptures daily to see if what he teaches is true (cf. Acts 17:11). 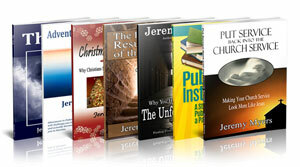 A pastor’s purpose is to point people to Jesus, and teach the Word of God, and explain and apply the Scriptures. If you think that I am doing that, than you can listen to what I say. But as soon as you hear me – or any human teacher – expounding my own ideas, or my own thoughts, dump me faster than you dump your garbage. Only listen to human teachers as far as they explain and teach the Bible. And even then, it is up to you to discern if they are correctly teaching and rightly dividing the Word of God. Do not listen to me, but listen to the Word. My goal is to help you understand and apply the Bible. Why? Because it is only when you allow God, through His Word and Jesus Christ, through the Spirit that is in you, to teach you, that you will become like your teacher. Do you want to become like God? Do you want to become more and more like Jesus Christ? 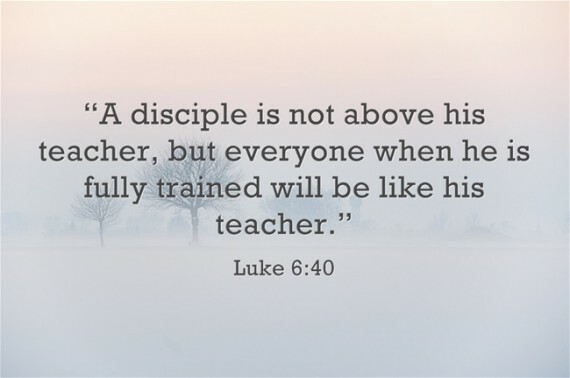 Then learn from them, for a student, according to Luke 6:40, when he is fully trained, will become like his teacher. This is the second word picture from Jesus. The third word picture is the most memorable of all. It’s the picture of the “log eye” guy, the guy with the log in his eye. Luke 6:41-42. And why do you look at the speck in your brother’s eye, but do not perceive the plank in your own eye? Or how can you say to your brother, ‘Brother, let me remove the speck that is in your eye,’ when you yourself do not see the plank that is in your own eye? Hypocrite! 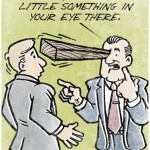 First remove the plank from your own eye, and then you will see clearly to remove the speck that is in your brother’s eye. I just love Christ’s humor. A father was once having family devotions with his children, and came to this passage. As adults, we have been trained to read the Bible seriously. But as this father read this passage to his children, his four year old son broke out in hysterical laughter. The father, thinking that family devotions were not the proper place for such boisterous behavior, soberly asked his son what he thought was so funny. The boy said, “What you read was funny.” The father looked down at the words again, and saw them in a whole new light. Though he had read these words a hundred times before, he had never seen the joke. 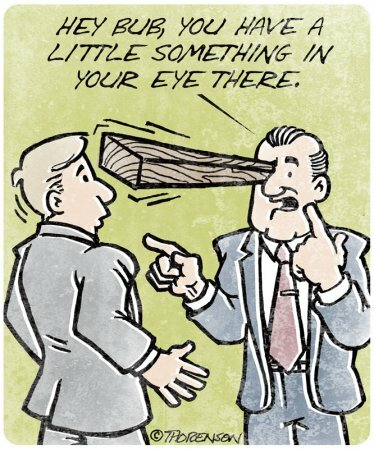 A plank in someone’s eye! It’s preposterous! (See The Humor of Christ). You turn to him, and are shocked to see that he’s got an eight foot two by four sticking through his head. Are you going to let him get a speck of sawdust out of your eye? I don’t think so. Would you trust a doctor that was coughing and wheezing and spitting up blood tell you how to get healthy? Would you trust a contractor to build your home, when his own home is condemned for safety issues? Would you trust a bankrupt banker to tell you how to invest your money? No. In all of these cases, no. When I was at Moody Bible Institute, my roommate’s father was playing racquetball one day, when he got hit in the eye with the racquetball. He probably would have lost his eye if it weren’t for the safety glasses he was wearing, but his safety glasses weren’t very safe. For some reason, they were made of glass, and shattered. A splinter of the glass went into his eye. It was so painful, he couldn’t blink, and had to hold his eye open with his fingers. They took him to the hospital where he had surgery to remove the shard of glass. They were able to save the eye, and he can see fine. But do you think he would have let the doctor operate on him if the doctor had just got in a car accident and had a windshield in his eye? Of course not. Such an application of this verse has blindly missed the point. The point of this third picture is not to look for the logs that others carry around in their eyes. The point is to look at yourself first. That’s what Jesus says there. First remove the plank from your own eye. You are not the one with the speck. You are the one with the plank. Far too many of us love to apply the Scriptures to everyone else but ourselves. We hear a sermon, and think, “I sure wish so and so had heard this sermon. He really needed it.” We have our devotions and come across a convicting verse, and decide to send it in a letter to a friend who needs to hear it. We read a Christian book addressing a particular sin, and we buy a copy for our relative. What are we doing? We are becoming eye-inspectors looking for logs in other people’s eyes when we have a whole forest in our own! We need to become “I” inspectors. Inspect yourself first. Look in your own life. Search your own heart. Apply Scriptures to yourself. You should never teach Scripture to others, or try to correct someone else’s sin, until you have corrected yourself first. You must get rid of that sin in your life that you are conveniently ignoring before you can help someone get rid of the sin in their life. Don’t overlook your own failures by focusing on the failures of others. And it’s not just the failures of others. It’s also the insignificant concerns we focus on instead of the glaring sins in our life. How sad it is that we get so worked up about politics and sports and the weather and our physical ailments, yet ignore the glaring deficiencies of our own souls. The things in life we get upset about are trivialities compared to our intense spiritual needs. Satan loves to keep our attention on anything else, as long as we don’t fix the sin in our lives. When was the last time you were more concerned about sin in your own life, than you were the balance of your checkbook? When was the last time you were more overwhelmed about your spiritual failure than you were your transmission failure? When was the last time your heart broke more over your own spiritual needs than your physical needs? When was the last time you were more upset about not reading your Bible today, than you were about not getting a cup of coffee? Do you see the hypocrisy we all live in every day? And that’s not my word, it’s the word Jesus used. It’s hypocrisy! We tell people how concerned we are about our pancreas, when we don’t give a second thought to the gaping, rotting wounds of sin covering us from head to toe. The question is not, “How could they?” but “How could we?” We must look to our own sin first. This is the truth of Luke 6:39-42. If you are a disciple of Jesus Christ, you must be honest with yourself. If you have trouble seeing your sin, and your failures, go to Jesus and ask Him to point them out to you through prayer and through His Word. And He will. Be ready for some painful “I” surgery. But you will come out with better vision, and better eyesight, because you looked to yourself first. An excellent interpretation. (y) Shared. 1) are you really saying that someone struggling with sin (whatever that actually means) cannot in some form/fashion “teach Scripture to others”? Seems like such a struggling believer may actually benefit from seeking to “teach Scripture to others”. Of course, if you are referring to a formal teacher, that is standing up as a teacher/leader I can see the issues, but i expect most readers/listeners are not in that category and would want to be encouraged to “teach Scripture” rather than told to “correct yourself”. 2) “correcting yourself” – what does that actually mean? it sounds of course like doing things to be less sinful. I understand “getting rid of that sin in your life”, but it seems like Jesus is not really talking about that because he would have just said, see and get rid of YOUR speck first. It is much bigger, and really can only be “corrected” by Jesus’ himself. 3) could it be the parable is trying to get me to realize my “plank” is something I can not correct? but that at the same time, needs real correcting as you say? and the issue seems to be in acknowledging my “failure to see the plank” and my “overlooking”… how do i correct that? because I think once i see it, i will know i need someone to correct it, not me.. and if i find that correction (Jesus’ sacrifice, grace of God) i can surely teach Scripture and also see clearly to help others with their speck. 4) really thinking as i write this out, if i seek to correct my own sin, and see my own failures… i can easily be going down a real slippery slope, where i realize i can never correct them all and will continuously see more and more failures. And i want to pull back and stop looking. I think that is why Jesus used the extreme word about a plank. It’s everything I needed to hear today. I am a school teacher trying to memorize luke 6:39-42 with my third grade students, yes so far we’ve enjoyed the humor in the text, but now I realize there’s much more to it … and It’s my prayer that the Holy Spirit will help us to digest all of it! Amen!